We’re hoping for a pretty day on Saturday — at least no rain please! We’ll be in Forest Hill Park from 9am to noon either way along with an excellent group of local farmers, artists, chefs, bakers and candle makers. Some highlights are below. Scroll down for the full vendor list. See you there! 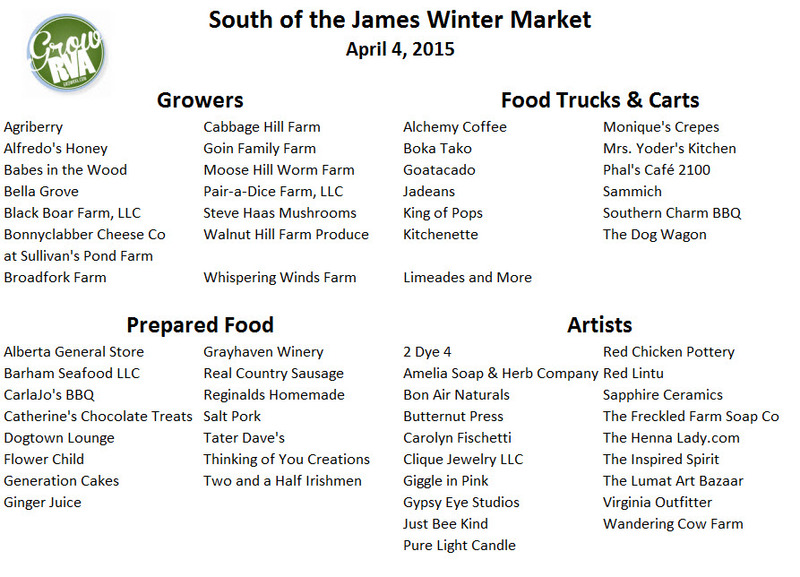 This weekend look to market vendors for lamb, eggs, early spring vegetables and much more to feed your family. You’ll also find fun treats — both edible and non-edible to fill baskets. Spring is a fabulous time to find edible and decorative plants for your garden beds, pots and window boxes at the South of the James Market. Local growers have a changing variety of young plants each week and will give you tips for taking care of them too.